It seems the only kitefishers not catching fish are the ones that either aren't going fishing or those being hindered by light wind conditions. Good snapper catches from East Coast fishers in the areas of Papamoa, Tauranga and Gisborne have been reported over the last few week. The best catch I heard of recently was from Joe Tuhimata fishing his bottom longline rig at Uretiti Beach. Joe hauled in a huge 28 lb snapper which, to my knowledge, beats the current Auckland area cast coast record held by Derek Rogers since around 1990 with a 26 pounder taken from Orewa Beach. I can't do much to help those kitefishers who choose to stay home, but those challenged by light winds, or any other adverse conditions, do have some options. The first thing to look for if your kite struggles to stay airborne when you know darn well there is wind, is what obstacles are behind you. Areas like Baylys Beach Dargaville, Kariotahi Beach, Waiuku, or Pakiri Beach (near Leigh on the east coast) all have high background hills which cause down drafts and wind eddies. Looking for gaps in the cliffs and launching your kites there before moving up or down the beach to your preferred fishing possie is always a good idea. In light winds you don't have to run up and down the beach with your kites to get them airborne, although this may be great exercise, it is not really necessary. A more successful way of launching your kites requires two people and a geared beach reel. Have your kite and skyhook all ready and attached to the kiteline. Send your fishing buddy along the beach in the direction which gets your kites as close to down wind as possible. You know your buddy has walked far enough when the kiteline, plus about 100 metres of mainline, is off the reel. With the skyhook laying flat on the beach, spar side down, and the kite cross spar simply resting on the finger tips of your fishing buddy, start winding the line back in on the reel. A geared reel can retrieve the kites a lot faster than you could possibly run. The speed of retrieval sends the kites skyward and by the time the flag is back to your reel the kites will be at their full flying height and will find their way to the down wind position. Reducing the amount of drag on your line is another key point to improve setting efficiency in light winds. For instance, on a bottom longline rig it is better to get 15 hooks 1000 metres offshore than 25 hooks just bouncing around in the surf zone or running along the beach. You don't HAVE TO set all of your hooks. Drag can be reduced further by using rolling weights (described in full in a previous kite report printed about 3 or 4 months ago) rather than the cylindrical clip on weights. Once you have managed to set your gear successfully in problem areas, the next issue is to be able to keep your kites flying or stable between sets in areas where inshore turbulence occurs. You will notice that your kites fly perfectly when the gear set out to its full fishing distance offshore but as you retrieve the gear in order to remove fish, re-bait and set out again, the closer your kites are to shore the more unstable they become as they approach the wind shadow. An easy way to overcome this is to extend the length of your leader section on a bottom longline rig (to around 350 - 500 metres depending on the area and the size of reel you are using). Keeping the drag issue in mind, the weight of the leader section can safely be reduced from 100 kg down to no less than 65 kg as long as the lines are joined correctly by using crimps rather than knots. (Hope you kept that back issue of Fishing News showing this procedure in detail). Knots can weaken the line by as much as 45% and also wear out over time due to the sand abrasion as they are dragged along the bottom. Be sure to check and re-tie any knots on a regular basis. Longer leader sections allow the kites to remain in clear turbulent free winds offshore between sets. Dropper rig fishers can easily improve their rigs light wind performance by either lengthening their kitelines or dropper lines or, on the larger 65 kg rigs, by simply connecting the dropper line to the second dropper cord back in the mainline. These simple procedures all give the kite access to more wind at higher altitudes. 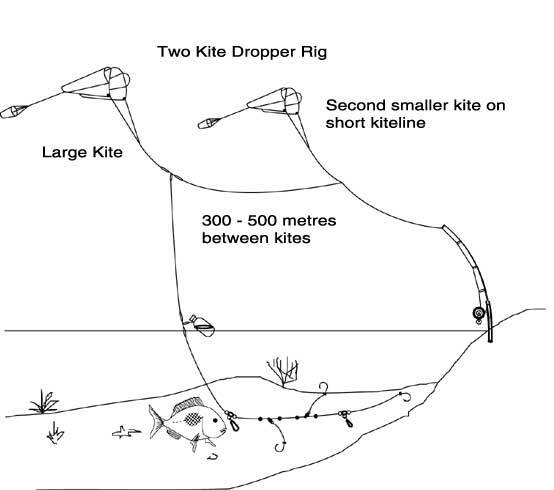 Another method of improving light wind performance unique to the dropper rig systems, is to attach a second kite to the mainline to help keep the mainline supported clear of the water. This eliminates the drag caused by the mainline being in the water and increases the sail area available to tow out the gear in marginal conditions. The pull provided by the front kite is dedicated to pulling the dropper line, bottle and weighted hook section out while the second kite back pulls the mainline off the reel and holds it clear of the water. (A second kiteline of around 50 metres in length is required for this operation). The two kite system is a top solution for any dropper rig. The weights applied to the hook section will make a big difference to your catch and determine whether you return fish, paddle crabs or even have all your baits return. Reading your gear during retrieval is very important to determining if your weighting was correct. Obviously the ultimate is to have your line return with fish evenly spread along the hook section. If your line returns with all the baits intact, this is generally a fair indication that your mainline has been under weighted and lifted off the bottom once it has reached the full fishing distance offshore. Hooks returning with no fish and no bait can be caused by one of two things. Either the bait used was too soft to last the distance or the gear has stalled in the first couple of hundred metres offshore allowing the paddle crabs to get a purchase on the baits. Like many little anchors on your line, they bury themselves with your bait. When the line begins to move offshore again the baits are ripped from the hooks. Over weighting your hook section in light winds will cause the gear to stall and leave you open to crab attack. Be sure to watch your kites during the first 300metres or so of the set, if they don't appear to be moving offshore you should not be feeding more line into the surf. The ideal setting speed, particularly on a bottom longline rig, is a slow walking pace. As long as the gear is moving steadily offshore the paddle crabs cannot latch onto your baits and bury themselves. Kitefishing Club members' phone lines were running hot early August with the news of Bob Walkers catch taken from Muriwai Beach using his bottom longline rig. Fishing only 400 metres out, Bob landed a mixed bag of sharks, kahawai, 16 gurnard, 3 snapper averaging around 2 kgs each and a whopping 13 kg snapper which he proudly displayed at the club meeting the following night. The Kitefishing Club meets on the first Tuesday of every month at 7:30 PM at the Manukau Cruising Club on Orpheus Drive, Onehunga. Visitors are more than welcome to attend. The club also holds a kitefishing demo day once a month on the first Sunday following their meeting. Details of the demo can be heard by tuning in to 1ZB talkback on the Sunday morning. September is notorious for big snapper on the West Coast so dust your gear off, give it the once over and good fishing! Don't forget about our photo competition.